Occupy Philadelphia: This is Real! 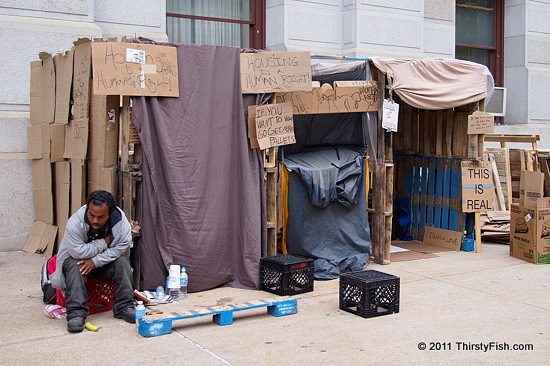 The homeless have found a home in Occupy Philadelphia. The movement serves food, provides basic medical help in the medic tent, and has built shelters for the homeless that commonly reside in the parks around City Hall. Since the 2008 economic crisis, homelessness has been on the rise throughout the United States. An increasing number of middle class families are finding themselves in homeless shelters. Last Friday's post touched on the idea that many poor and homeless people are not looking for handouts. They are looking for some guidance and some opportunity. For many, homelessness is a temporary experience. There is nothing wrong with being your brothers keeper.